Everything you love about a cheeseburger in one creamy bite. 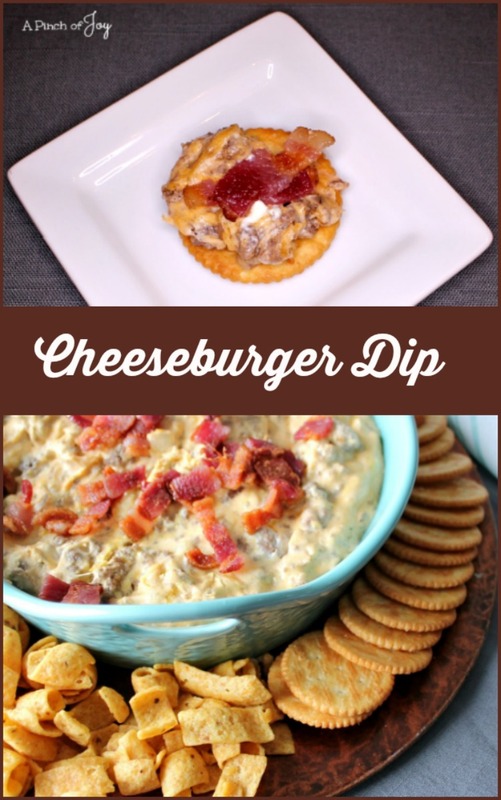 Cheeseburger Dip has it all — hearty beefy burger, creamy cheese, ketchup, mustard — in one spoonful. Serve it on a cracker, scoop it with a chip, it’s all good! Top it with bacon chunks for even more goodness. Cut the bacon into small pieces before browning. It will crisp faster that way. It also saves burned fingers because you won’t be trying to cut hot bacon into pieces. I add half the mustard because its not my favorite flavor so I would order my cheeseburger without, but you can go all out and add all the recipe calls for. If you brown your bought on sale hamburger before popping it into the freezer, measure out two cups browned ground beef and save yourself some time. You can use any cheddar cheese or even cheddar jack or Colby. Once the cheese just starts to melt, remove the pan from the heat and pour into the serving dish. If you continue to stir over the heat and try to melt it thoroughly — well, you might have something the right consistency to patch concrete! Not that I have done that. At least not more than once. 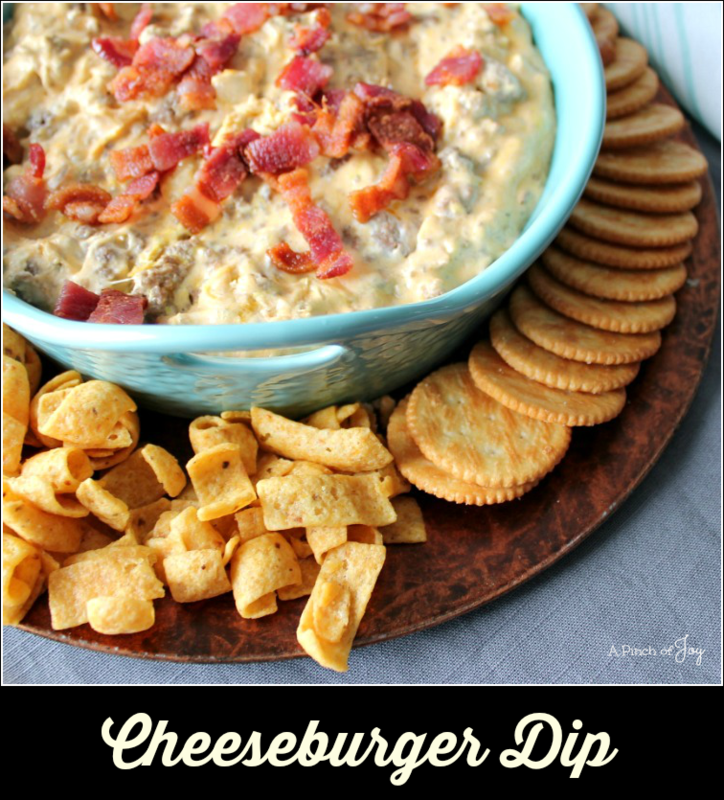 For more dip recipes, check out these 12 awesome appetizers or Mississippi Sin Dip. Cut bacon into one inch pieces. Brown bacon in skillet over medium heat or microwave in two minute bursts until slightly crisp. Set aside to cool. In the same skillet, saute chopped onion in oil until translucent. Return beef to skillet with onion. Add Worcestershire sauce and garlic powder. Reduce heat under the browned ground beef and add cream cheese cut into cubes about 1 inch. Stir until cheese begins to melt. Mix in mustard and ketchup, then sour cream. Add shredded cheese and stir until just mixed. Scoop into hollowed round loaf of bread or bowl. Top with remaining shredded cheese, and bacon chips. Add sliced green onions and/ or pickle relish for additional garnish if desired. Serve with sturdy dippers such as crackers, toast rounds, or corn chips. I’m so glad you stopped by today! Follow A Pinch of Joy using the icons on the blue bar at the top of the page so you don’t miss a thing! I’d love to have your company on this venture!! Share: if you found this helpful or inspiring please click one of the buttons below! Your support of A Pinch of Joy is appreciated! This is looking soo much testy. What a wonderful ideas of making cheeseburger.